Creambelt Seed Co. | Faddegon's Nursery, Inc.
We’re excited and pleased to welcome another seed company to our collection! Creambelt Seed Co. is the brainchild and passion of Sarah Morley. She has worked hard to bring us these beautifully packaged heirloom variety and regional favorites seeds. From the Creambelt website: Sarah can say it better than I can! 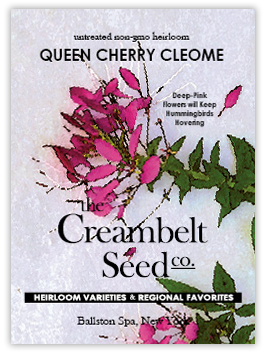 “The Creambelt Seed Company is pleased to offer our 2015 line of untreated, non-GMO garden seed for robust heirlooms and regional favorites. These varieties of vegetables, flowers and herbs have flourished in planters, gardens and fields for generations. We hope you will be part of the tradition of selecting and growing plants for excellent flavor, texture, scent, color, habit, resistence and vigor.